Three pounds of pure playing fun. 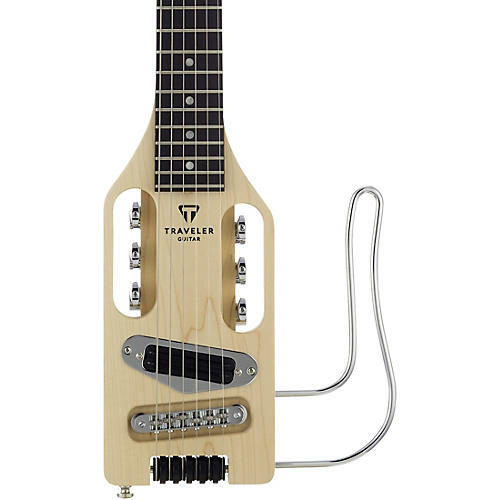 The Traveler Guitar Ultra-Light Electric is one of the smallest, lightest full-scale electric travel guitar ever made. Complete with a high-output dual-rail humbucker and a lightweight detachable lap rest frame, the guitar weighs three pounds and is only 28" long. The Ultra-Light fits into an included high-quality gig bag that stows easily in airline overhead compartments. The Traveler Guitar Ultra-Light is the perfect solution for traveling players looking for the smallest, lightest solution available.